DEAR MAYO CLINIC: How effective is laser resurfacing for removing sunspots? Are there creams or other products that work to treat sun-damaged skin? ANSWER: Laser resurfacing and other forms of laser and light therapy can effectively reduce or eliminate sunspots. Certain creams also can be useful. Keep in mind, though, that if you don’t protect your skin from the sun, the spots will almost always return, or new ones will form. The medical term for a sunspot is lentigo (or lentigines for multiple sunspots). You also may hear them called age spots or liver spots. These spots on the skin are flat and round, or oval in shape. They are uniform in color, ranging from light brown to black. Because they are a result of sun damage to the skin, the spots are most common on areas of the body that have frequent sun exposure, such as the face, shoulders and hands. Laser therapy, as well as a treatment called intense pulsed light, can treat pigmented skin lesions, including sunspots. Before you move forward with any treatment, however, it’s important to be evaluated by a health care provider who is experienced in diagnosing and treating skin conditions. Your health care provider can review factors that could affect your treatment, such as your skin type, medical history, family history and any medications you take. He or she also will perform a thorough physical exam to confirm that the spots you want treated are sunspots. That’s a key step because not all brown spots are lentigines. For example, brown patches on the face could be another skin disorder called melasma. Using laser treatment on melasma may worsen that condition. 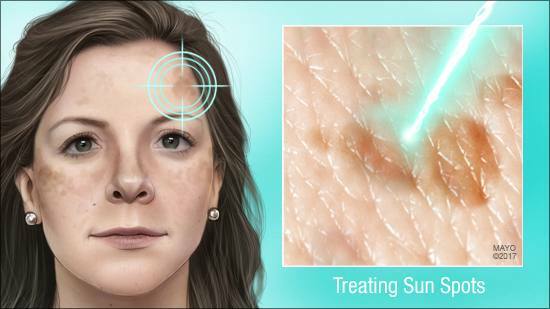 In some cases, the skin cancer melanoma also can look similar to sunspots. Identifying and treating melanoma as quickly as possible is critical to curing it. If laser therapy is right for you, you may need more than one treatment to achieve the best outcome. It’s usually done in a health care provider’s office and doesn’t require hospitalization. The length of the procedure and the time it takes to see results vary, depending on the specific type of treatment you receive. Potential side effects include redness, swelling, itching, changes in skin color and scarring. Because laser and light treatments are considered cosmetic, they typically are not covered by insurance. After laser treatment, to protect your skin and keep spots from returning, you need to use a broad-spectrum sunscreen with a sun protection factor, or SPF, of 30 or higher. To prevent sunspots, always use sunscreen, or wear protective clothing when outdoors. Topical creams can be an alternative to, or used in addition to, laser or light therapy to fade sunspots. Effective options include topical retinoids and a bleaching cream called hydroquinone. These creams are available by prescription from your health care provider or in lower-potency nonprescription forms in retail pharmacies and drugstores. There also are many other topical agents available over the counter, such as antioxidants that may improve the appearance of sunspots.